Hello, i've recently got a double of one of my favourites, Rose Dust a flutter Pony G1. However on closer inspection, there moulds and paint are completely different when compared. (not just the faded pink hair haha) i was thinking it could be a different production run or a country specific (a nirvana) but none have been known to exist. But for it to be a Nirvana i thought the hoof had to be labled with a different company. When these state the general 'Hong Kong'. The only other guess of mine was that there where 2 production runs of these as from what i've seen online is that there's 2 different prepackaging types. One stating special offers and the other not having the circle with special offers but also having a different pose pony art. So i was wondering if anyone had noticed the same with Rose Dust or any other of the Flutter Ponies? As i guess this could effect them all. For the purpose of this post ill be referring to my pony who has the white (pink faded) hair as RD1 the one i suspect to be the most common and RD2 the one with pink hair as the one who seams to be the different one. I suspect RD1 to be the general one as the rest of my flutter pony's have the same shape and mould. would love to hear what you guys think and if you have a flutter pony who resembles RD1 or RD2. this would be a great help in finding out why these exist! these are the differences i have noticed. Eye is also 2mm bigger and has a thicker Iris and white dot. dot is also lower down. Eyelashes on RD2 are longer. to the eye crease where RD1 has think and stubby eyelashes. RD2 has a darker green cutie marks, however i cant be sure on as RD1 has more has fading and has had more play to her. RD2 is made out of a more see though plastic allover. RD2 makers marks are very light and less visible. So what do you guys think? i know you have allot more experience in this area so it will be interesting to hear back! feel free to share pictures of your own Flutter Ponies. It would be even better if you could state what version you think you have. I've heard that some flutters have thinner heads and some bigger. I've heard people call them Fat Head Flutter Ponies. thats great! thank you so much! 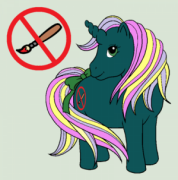 they should put this kind of stuff on the mlp Guides. i serched everywhere but nothing terned up so this is amazing to know. Yup, just the fat head flutter mold.